This week Lt. Gov. Brian Calley made a somewhat unfair accusation against fellow Republican gubernatorial candidate, Bill Schuette. 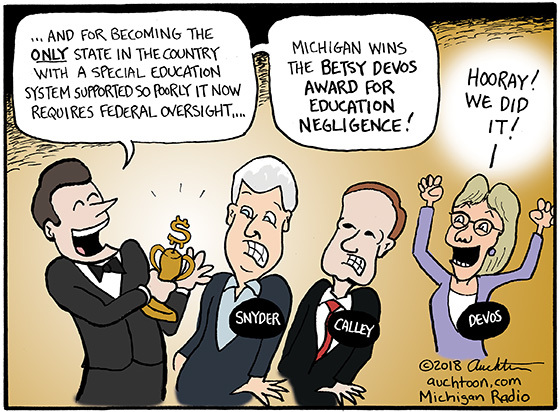 Calley’s team obtained Schuette’s work calendar through a Freedom of Information Act (FOIA) request and noticed large gaps between appointments. Calley interpreted this as Schuette basically only working 104 full days in his eight years as Michigan’s Attorney General. That’s a big stretch, but consistent with Calley’s ongoing narrative that Schuette works more for himself than the people of Michigan. The natural question then is: What does Calley’s work history look like? But since that isn’t available by a FOIA request, Calley himself would have to supply it. Which he won’t, at least for now. He says it would involve too much information about other people’s schedules in government, and he needs to be careful. While technically a plausible reason, I think we can all agree it scores pretty high on the weasel scale. The chair of the Michigan Democratic Party chimed in to say, “We’re glad Bill Schuette and Brian Calley are finally recognizing that neither of them have been doing their jobs.” As if all of their candidates have pristine work histories. Uh-huh. Here’s the thing, though. If I were to be falsely accused of not working enough hours to qualify as a full-time worker, it’s difficult to imagine Bill Schuette siding with me over, say, a corporation. Especially on a healthcare issue. 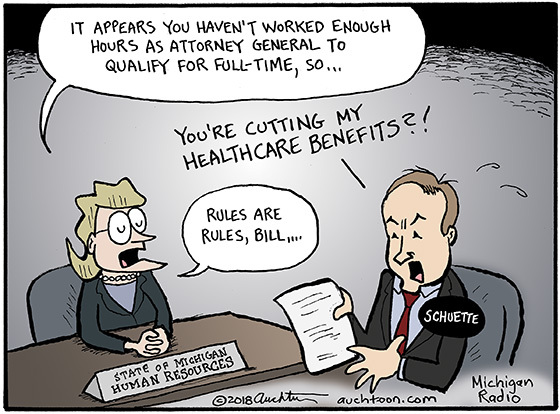 So it’d be kind of satisfying to see Schuette lose his benefits long enough to experience firsthand the joys of being on the outside of the system. This was either outrageously ambitious or incredibly ill-timed because I had just heard a report on Michigan Radio that Michigan has recently become the only state failing to meet special education requirements and now requires federal intervention. Huh. That doesn’t make any sense. How is Calley going to make us the best, when he proudly aligns himself with the leadership that has made us the worst? It’s a direct contradiction, and yet I have all been so thoroughly gaslit these days, I start to question myself. Technically, the mailer wasn’t from Calley or Calley for Governor, but from “The Fund for Michigan Jobs.” Did Calley even know about this? Can he be held fully accountable? Aren’t there other players who have contributed to this? And I have heard on more than one occasion that Calley is an advocate for those with special needs and a fine Christian man. “Whatsoever you do to the least of my people….” Calley knows all about that, right? Thoughts can become muddled quickly, which is why it’s especially important to seek fresh air and breathe the truth whenever possible. A women named Marcie Lipsitt seems to have a handle on this particular situation. As a special education advocate for 20 years, Lipsitt is able to provide a full assessment of how the Michigan special education system has reached this low point and a clear-eyed vision (that is without political agenda) for improving it. I encourage you to listen to the full story. Michigan Radio had a story this week about the Michigan State Employees Association union petitioning to allow state park rangers to carry guns. Some rangers do not feel safe, citing a perceived uptick in illegal activity and are suggesting guns and bulletproof vests as a solution. Phew! How was that? It took me quite a while to write that paragraph. It was really difficult to figure out how to tell you what happened as impartially as possible. Still, some of the words are inevitably tripwires (guns, state, union) — they instantly take us off the actual topic and into a race to tell those with a differing view how stupid they are. 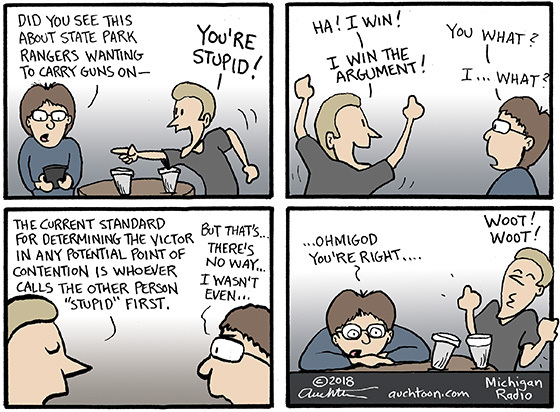 That’s pretty much the reason why the cartoon stopped being about the park rangers and guns in the first panel. I just couldn’t figure out a way to wedge something witty and insightful ahead of the inevitable breakdown. As a editorial cartoonist, I’m the last person in the world that should be judgmental about this. In most cases, we are the ones actively laying the tripwire. And we know how to do it because something has already set us off. So to be clear: I most definitely believe some people and the opinions they hold on certain topics are in fact stupid. But if the goal is to persuade them to change their minds, then leading with “you’re stupid” is perhaps not the most effective strategy. 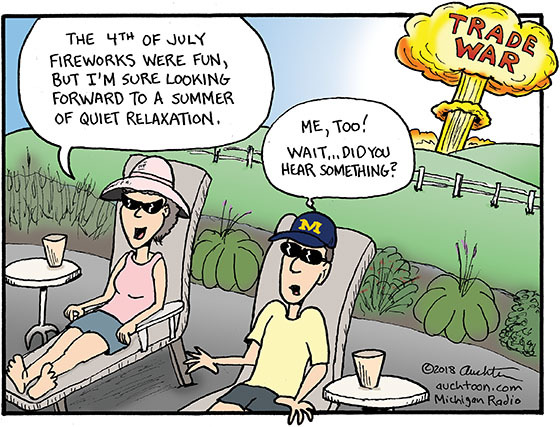 Whether you prepare for the looming trade war with a cold beverage by the pool or panicked online shopping (may I suggest the Michigan Radio Store if you intend to throw money? ), I will not take any more of your time this week. No matter what happens, the constant remains that summer in Michigan is too short.